Things are starting to get crazy in Pasadena. It looks like the rain has stopped (for a few days anyway) and the rush is on to finish decorating the floats. Fans from TCU and Wisconsin are everywhere in Pasadena preparing for the New Years Rose Parade and Rose Bowl Game. It's a special time of the year and it looks like we will have a cooler but sunny New Years Day! I had intended to finish this painting much earlier in my schedule but the holidays and a bad case of the flu just didn't allow me to finish this one until today. I love nautical flags ... so I thought it would be fun to create my own flags that highlight the festivities in town this week! The final giveaway for the Twelve Days of Christmas, which was a free painting, was won by Jerry Stocks. Jerry came out to the workshop Dreama and I taught in Pasadena. She is also coming to our Atlanta workshop in February. I might just get to hand deliver her painting! Congratulations Jerry! So ... my Twelve Days of Christmas sharing are complete. This idea was all about sharing ... sharing giveaways with all of you and also hopefully sharing some good ideas about how to use facebook and your blog to promote your art. The "concept" kind of grew on it's own over the twelve days and I have really learned how "sharing" and "like buttons" on Facebook can help expose your art to others. I would estimate that my blog and website gathered about 4000 new hits over the twelve days. Most importantly, I feel as if I have gotten to know a lot of people during the "twelve days" and the entire experience has been a blast! Thanks for putting up with me! Many of the prizes shipped out before Christmas but I will put the rest in the mail tomorrow. Thanks again, and I don't think I will be able to wait until my birthday to do another promotion like this ... so check back often! The winner of the Eleventh Day of Christmas giveaway is Carrie Waller. Carrie is the first repeat winner! Today is the last day of the Twelve Days of Christmas and the giveway is, of course, one of my paintings. The winner can pick one of my 6x6 or 8x8 paintings or I can paint one similar to one that may have already sold. I hope you are all enjoying this holiday season. In order to be eligible for this final giveaway, all you need to do is post a comment on my blog or facebook page. Happy Holidays! The winner of the Tenth Day of Christmas $100 gift certificate is Gretchen Zelek! Congrats! And all you have to do to be eligible is to visit my website again and share as many LIKE buttons as you can! I have added at least twenty more LIKE buttons so you may have to find them ... Every time you share, you get a chance to win. The winner of the Ninth Day of Christmas copy of my new book titled "2010- A Year of Boat Paintings" is Wendie Thompson. Congrats! The giveaway for the Tenth Day of Christmas is a $100 gift certificate toward the purchase of one of my paintings. To be eligible for the drawing, just go to this page on my website and leave a comment on my blog or Facebook as to which three paintings are your favorites. I am just looking for feedback! 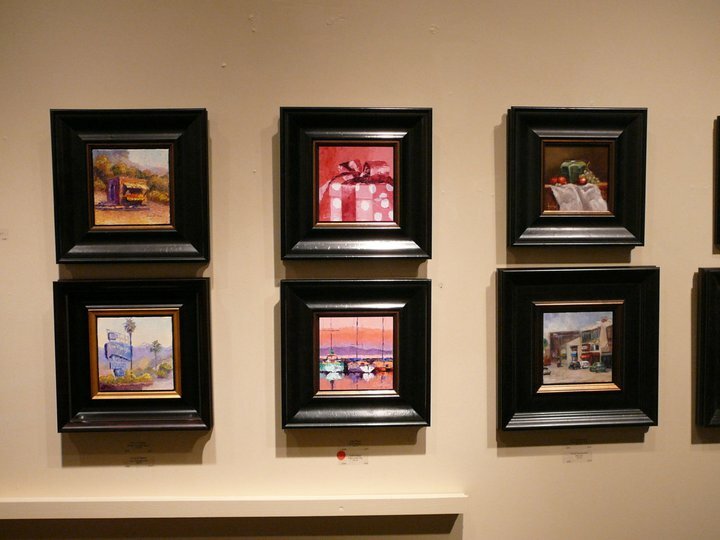 The winner of the Eighth Day of Christmas $100 gift certificate from Randy Higbee Art & Frame Company is Dee Doyle. Congrats! 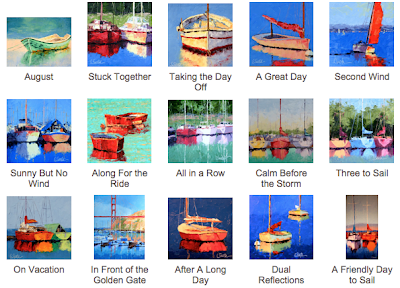 The giveaway for the Ninth Day of Christmas is my new book titled "2010 - A Year of Boat Paintings". All you have to do to qualify for the giveaway is go the book site here and share my book on Facebook (you will see the Facebook logo - just click it!). Then leave me a comment on facebook or my blog so I know you have shared it! The winner of the Seventh Day of Christmas "Artists Helping Artists" painting apron is Kim VanDerHoek. The giveaway for the Eight Day of Christmas was graciously donated by Mr. Santa himself, Randy Higbee. Randy owns Art & Frame Co. and the Randy Higbee Gallery. He most recently hosted the world renown "6x6 Squared" painting exhibition that was the talk of the artist community. Randy has donated a $100 gift certificate toward the purchase of frames. This is an awesome gift! In order to be eligible for this prize, you need to visit my website and find one of the Facebook LIKE buttons. Just click one of them and you are eligible! In fact, every time you click a LIKE button on my website you will win another chance. The LIKE buttons have been located throughout my website so you should be able to find them! But if you can't, look on the Workshop page and the individual pages of the paintings that are for sale! This is the first painting I have completed in a while ... too busy with the holidays but it was fun to be back at the easel. 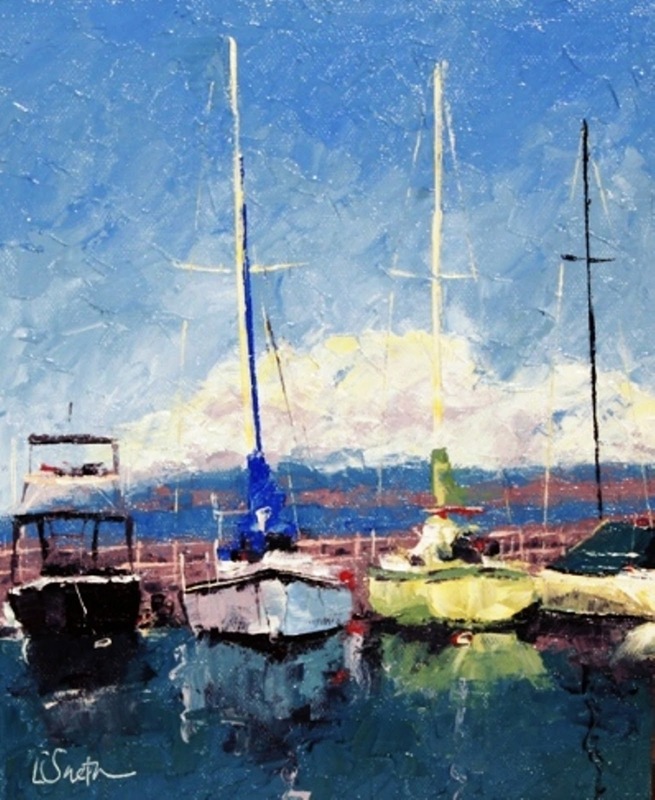 The winner of the "Sixth Day of Christmas" Two Day Palette Knife Workshop is Lynn Watters. Congratulations! The free giveaway for Day Seven is an "Artists Helping Artists" logo'd painting apron. It's got great pockets for brushes (or palette knives) and it can be yours! All you have to do is suggest a topic for our weekly "Artists Helping Artists" radio show. Is there something you want Dreama and me to talk about that you, as an artist, would like to know more about? Just comment on my blog or facebook and let me know! Marketing Tip: Have you added Facebook Like buttons to your blog and website? Go to this link http://developers.facebook.com/docs/reference/plugins/like and "build your own" Facebook like button. The winner of the Fifth Day of Christmas $25 gift certificate is Roxanne Steed. Congratulations and happy spending! Sorry I am so late posting today but the party last night was amazing and needless to say ... I am finally feeling relaxed again. We are blessed with so many great friends and is always a joy to open our home and celebrate the holiday season. Most of the food is gone, which is so hard to believe. I promise you we are doing take out tonight if my family can't find enough leftovers! Today's prize is a good one. It's a gift certificate to attend my Two Day Palette knife workshop next month (valued at $195). The dates are January 14th and 15th and it will be held in South Pasadena. If you don't live in Southern California you can actually gift this to an artist friend. It cannot be used, however, by someone who is already signed up for my workshop. And it is only valid for the January workshop. For more details go here. To qualify for today's free giveaway, you just need to sign up for my newsletter. Click here to sign up. If you already receive my monthly newsletter just comment here and let me know and I will include you in the drawing! OK, I am stunned. Yesterday's "contest" generated 301 names for boat paintings. Which means ... of course ... that I will not have to come up with a name for one of my boat paintings for about TWO YEARS! You guys are amazing! It also took me almost two hours to make the list of all of the suggested names as they appeared everywhere ... in my email, on face book (in many different places) and on my blog. Wow. 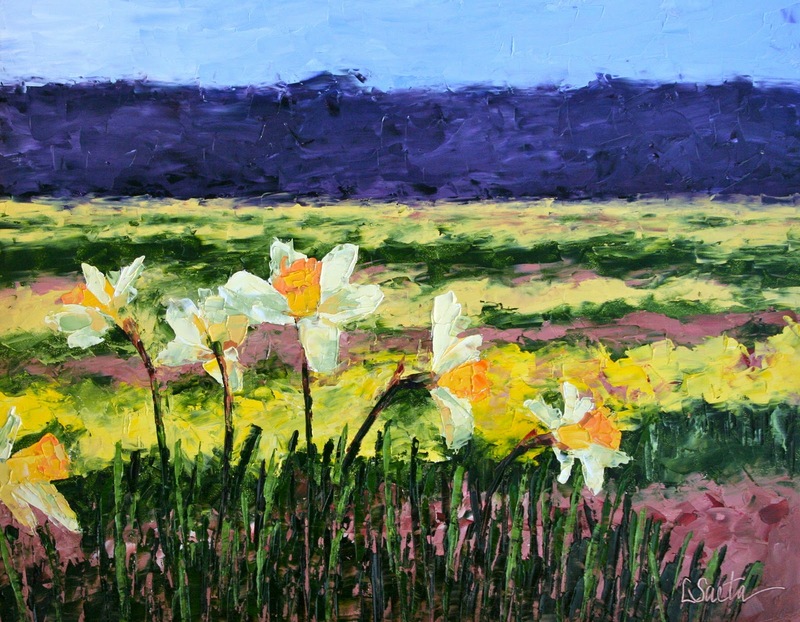 The winner of the Fourth Day of Christmas palette knives is Susan Hogan Girard. Congratulations! The prize for Day Four is a $25 gift certificate toward pretty much anything ... gift cards, gift tags, a workshop, painting, etc. And today is easy. I promise. Since I will be working on final preparations for our party (which is tonight ... OMG ...) you just need to comment on my blog or facebook post. That's it! Oil, 6" x *' on canvas panel. The winner of the Third Day of Christmas 24 notecards is Carrie Waller. Congratulations! I am pleased to announce the winner of the Second Day of Christmas fifty (50) Holiday Gift Tags is Karen Hartley. Congratulations! The prize for Day Three is four packages of note cards, which includes 24 notecards featuring my paintings. The value of this prize is $72.00. And the winner will be able to pick which notecards they want from here. To qualify to win the free giveaway, all you need to do is to comment on this blog post! This is really easy ... so just click the link below to comment and send me a message ... you can say anything you want! Today's Marketing Tip: I honestly believe Facebook is currently the hottest free marketing tool available for artists. So, using yesterdays's "google search tip" I found twenty (20) really cool Facebook tips. They include: How to Download Facebook Photo Albums, How to Share Flicker Photos to Facebook, How to Schedule Facebook Messages, How to Display Selected Pictures Only on your Facebook Profile Page and How to Post Your Blog Posts to Your Facebook Wall Automatically. Click here to find these great tips. I am pleased to announce the winner of the First Day of Christmas archival print from Imagekind is Kathy Cousart. I used www.random.org to pick the winner. It works every time! The prize for Day Two is a set of fifty (50) Holiday Gift Tags. These will ship out tomorrow so you can use them on all of your packages for the holidays! To qualify to win the free giveaway, all you need to do is to help Dreama and me with this week's "Artists Helping Artist's" radio show. Our topic this week is "Getting Organized". So email me an organizational tip and you can win today's prize! If it pertains to art then great ... if you are not an artist send a tip anyway. We are especially interested in any art sales management systems you might be using to manage your art business. Thanks!!! Today's Marketing Tip: Do you know the best way to find an answer to a marketing question? Just google it! The most common question I get is "How do I add Facebook Like Buttons to my blogger?". If you google the question, you will get hundreds of answers, including videos. Want to know how to "add Pay Pal Buttons to your blog or website"? Just google the question and tons of "how-to videos" are on the internet showing you how to do it. I know this sounds simple ... but it really works! Starting today, I will be giving away something free on my blog for twelve days. It's simple ... all you need to do is follow the simple instructions and you will be included in the drawing. At 11:00 pm each night I will randomly select the winner. There will be twelve straight days of winners. Plus ... each day includes a "free marketing tip". The gift for Day One is a medium sized (approximately 16" x 16" or 20" x 16") archival print of any of my paintings listed on Imagekind. You can view the prints in my Imagekind store here. Visit my facebook event page for the Twelve Days of Christmas here. At the top of the page click SHARE. Add a quick note (if you want) and click SHARE. If you are not a facebook friend of mine, just request me and I will add you as a friend right away! When you share my event on facebook I will get a post on my facebook page, and I will add you to the drawing. Just be sure and do this by 11:00 pm and send me a note so I know you have shared it (just to be safe!). You will need to have a facebook account to participate in this first giveaway ... but if you can't participate no worries ... there will be something else you can win tomorrow! So, I hope you will participate! Good luck! Marketing Tip #1: Facebook is an excellent way to share news and events pertaining to your art career. Create an "Event" on your facebook page and share it with all of your friends. (Even if the event is just happening on-line, create a facebook "event" and share it with your facebook friends!) Ask your friends to share your event with their friends. Listen to the "Artists Helping Artists" radio show on January 6th to learn how Randy Higbee at Randy Higbee Gallery used facebook to promote one of the most successful facebook campaigns in history! The "Twelve Days of Christmas" starts right here on my blog tomorrow In the spirit of the holidays and "gift-giving", I will be giving away something on my blog for twelve straight days. In order to qualify for the daily drawing you will be required to do something ... perhaps even as simple as posting a comment on my blog! And the prizes are cool ... they include a free painting, free workshop, merchandise and other fun stuff! It's all for fun. I have been so busy that "painting time" has been very scarce! 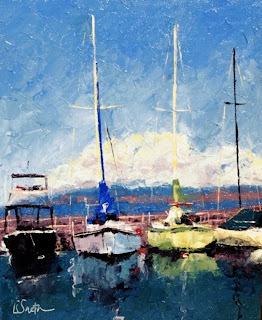 But a wonderful blogger named Joyce took the time to send me some wonderful sailing photographs and I knew I had to make time to get in the studio to paint! Thank you ... thank you Joyce for so many wonderful photos! Our holiday party is a week away ... egads ... and as usual I am cooking for 200 - 250 guests. I am a slave in my kitchen but truly loving it. I think I finally have "party preparation" down to a science. I also have a two day palette knife workshop coming up in January. It's here in South Pasadena and I have three spots left. I have decided to add a homemade gourmet dinner (served at my house) to the class ... it's a wonderful time to stay up and chat about all things pertaining to art. For more information, click here. Next week on the "Artists Helping Artists" radio show, Dreama and I will be talking about "Ways to Get Organized" for the New Year. We are looking for lots of tips from artists so please email me if you have any ideas you would like to share. We are looking for tips in and out of the studio! As I have mentioned previously, I had four Art Openings this past weekend. It was truly an amazing weekend and I am so thankful to Gale's Restaurant, Debra Huse Gallery, Segil Fine Art and Randy Higbee Gallery for allowing me to show my art in their amazing venues. I am eternally grateful to all of you who took the time during the holiday season to attend one of my openings. It was truly one of the most amazing art weekends in Southern California! The first four photos above are from my solo show opening at Gale's Restaurant. Lots of friends and new collectors attended and I even managed to grab a photo with my parents. The last photo is from Randy Higbee Gallery. What an amazing show! I am absolutely thrilled that I sold eight paintings this weekend. What a wonderful surprise and I loved meeting so many new collectors. I am truly blessed! This is my second video featuring my paintings in the Debra Huse Gallery Holiday Treasures Show which opens this weekend. For more information on my December shows, click here. Believe it or not, I actually do try to follow the wisdom on the "artists Helping Artists" weekly radio show. Last week we talked about using videos to promote your art. 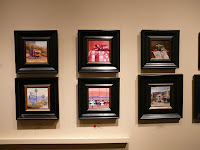 So ... here s a glimpse of my paintings that can be seen at my solo show at Gale's. Enjoy!